If you were to take a closer look at Giftssoft’s name, one would get the impression that this application enters your computer because it wants to help you save money whenever you shop online. Unfortunately, that is not exactly the case. Although it does seem like Giftssoft displays coupons and discount offers, most of those pop-ups are not reliable. If you wish to protect your computer from harm, you will have to remove Giftssoft immediately. There is no need to keep an adware application on your computer because adware programs are potential system security threats. Giftssoft is part of a huge adware family that is sometimes called the semi-random name group. It means that this application may randomize its name upon installation, but it does not matter how Giftssoft’s title is spelled in the list of installed programs, the program is still the same. What is more, it is practically identical to such notorious adware applications as SaveNShop, RealDeal, RightCoupon, SaveON, and many others. Just like its counterparts, Giftssoft does not have a direct download link. This program usually gets distributed via InstallRex installer. Sometimes, based on your location or the file sharing website you access, Giftssoft may also come via Amonetize or Vittalia installers. To put it simply, it is easy to avoid Giftssoft if you stay away from torrent and other file sharing websites. However, a lot of users still install this application onto their computers along with other potential threats. They notice that something is wrong only when Giftssoft adds extensions to their default browsers, and soon they get spammed with commercial ads. Since these ads can be exploited by malevolent third parties for malware distribution, you need to ignore them and uninstall Giftssoft at once. Manual adware removal is not complicated, but we have to emphasize that there are definitely more unwanted applications onboard your computer. If you don’t know how to locate them, scan the system with the SpyHunter free scanner. Do not hesitate to acquire a licensed antispyware tool if need be. Open Uninstall a program and remove Giftssoft. Go to Uninstall a program and remove Giftssoft. 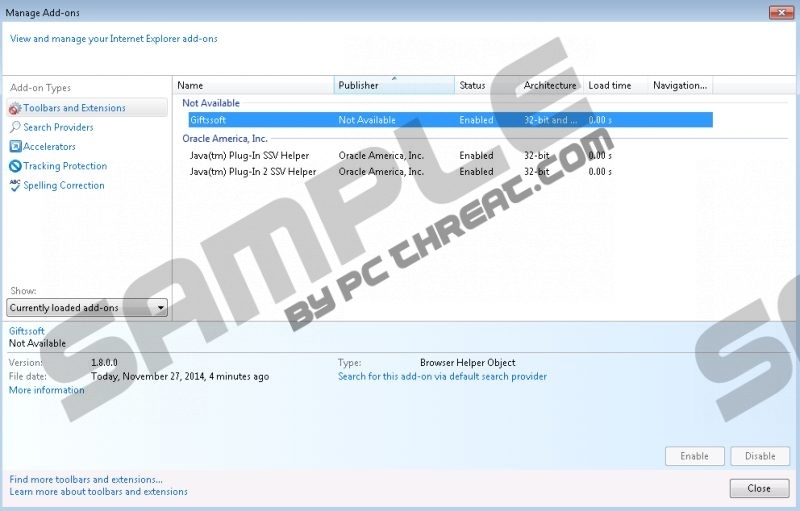 Select Add or remove programs and uninstall Giftssoft. Remove Giftssoft from the list. Disable and remove Giftssoft from Extensions. Quick & tested solution for Giftssoft removal.